Backpacks for travelling need to be able to handle some punishment, but not all backpacks are of the same high quality! It pays to spend some time comparing the different brands and models, so you can make sure you choose a quality travel backpack. 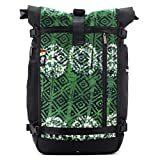 Having checked thousands of travel backpack reviews, we can say that the Ethnotek Raja is the best choice for most people. The Ethnotek Raja got a rating of 4.80 out of 5, while the average rating in the list below is just 4.33. This is the best reviewed travel backpack. We have checked 92,137 travel backpack reviews, so we can show you the weighted average rating of all the bags. If the Ethnotek Raja isn't your style, you might also consider the Osprey Porter. The Porter is a close runner-up with a rating of 4.67 out of 5 - and it's usually cheaper than the Raja. The second-best reviewed travel backpack. Finally, you might consider the Osprey Farpoint. The Farpoint is the third-best rated travel backpack with a rating of 4.56. The third-best reviewed travel backpack. Below is the list of all top 27 best travel backpacks. Great if none of the three bags above are your style. PS: We have checked 92,137 reviews to make this top 27 list! There are few types of bags that are handier than the trusty backpack. These comfortable and durable pieces of luggage are perfect for most occasions and will never let you down. This is why, if you are someone who travels quite often, having a good travel backpack can make all the difference. It doesn’t matter what type of travel that you do, a backpack is undoubtedly the ideal solution. It is easy to carry, has more than enough space, and can be organized quickly. If you are looking for a piece of luggage to make your life easier, then a travel backpack is it. Of course, while these might be a versatile form of bag, it isn’t always easy to pick out a travel backpack that works well for you. This is often because there is so much variety and options involved. If this leaves you scratching your head about how to pick the right one, we’re here to help. Daypack: while this type of backpack isn’t strictly meant for traveling, it can easily function as such for short trips. The benefit of this design is that it is comfortable to wear and can even function as a carry on bag. The only real limitation that you may face is size. Rolling Backpack: simply put, these are travel backpacks with wheels. While they can be a bit bulky, their main advantage is that they are easy to transport. This allows you to carry a greater number of items if it is being sent as checked luggage. Laptop Backpack: laptop backpacks for travel can come in two forms. The first is the traditional one that can be worn on your shoulders. The other is a more compact and business-looking design that has wheels. Both can be taken as carry on luggage. Backpacking Backpack: this type of travel backpack is for those who are planning on doing a lot of outdoor exploring. These backpacks are large, rugged, and can be carried with you everywhere. Hybrid Backpack: these days, manufacturers are getting more creative with backpacks. This is why you will be able to find certain fusion-like designs. This includes the duffel/backpacks and even the backpack suitcase. After figuring out what type is right for you, the next step is to choose the size. Or, to be more accurate, the volume of the backpack. The size that you decide on is determined by the quantity and dimensions of the items that you are carrying as well as the length of your trip. 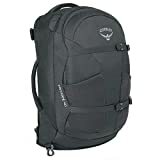 If you are just headed out for a day or two or are just looking for a laptop backpack, then a small travel backpack will serve you best. These, typically, are able to hold between 10 and 20 liters. These are mostly for just carrying a few clothes, digital devices, and perhaps documents. With a medium travel backpack, you will be able to head out on a weekend trip or even one that lasts several days, depending on what you are taking. You will find that these backpacks are able to carry about 25 to 50 liters of items. If a bag can carry more 75 liters, it is typically considered a large travel backpack. These can carry what you need for up to a week. Of course, if you are headed out on an expedition-type trip, there are bags that can reach up to 130 liters. These are ideal for carrying equipment and supplies as well. If you are going to be backpacking or camping, you may want to get the largest possible backpack. However, it is a good idea to stick with a backpack that has dimensions that are compatible with your torso. Ideally, a backpack should be able to sit between the base of your neck and your hips. This will ensure that your movement is not impeded and that most of the weight is carried by your hips. While these measurements can be a bit tricky to manage with larger backpacks, it is best to avoid overly large bags. Even expedition-size backpacks should be much higher than your head or well below your waist. You will find it quite difficult to move around if the bag is very long. Since these are travel backpacks that we are discussing, it is important to keep the weight of the bags in mind as well. Tough or large backpacks tend to weigh more than others. Since you have to adhere to certain airline weight restrictions, you should weigh the bags when they are empty. This will give you a more accurate idea of how much you can carry in your backpack. What Material Should You Look For? While it may seem like all backpacks are made from the same material, this isn’t actually correct. It is important to always take a close look at the fabric to ensure that it is suitable for your purpose. For instance, if you want to ensure that your luggage is as light as possible, you will find backpacks made from polyester are most useful as they don’t weigh much. However, it is important to look for ones that have high deniers. If you are more concerned with strength, then you will find backpacks made from nylon to be a better fit for you. In more extreme instances, bags made from ballistic nylon or ripstop nylon may be more appropriate. These materials are extremely resistant to abrasion and wear and tear. Of course, they do tend to cost more so they are usually only required for people heading to rugged terrain. If you want to afford your belongings some additional protection, you may want to consider materials that have been coated with water resistant or waterproof layers. These coatings will prevent the water from being absorbed by the material, at least for a little while. For those that aren’t overly concerned with strength but do want a backpack that is stylish, a canvas travel bag may be just the thing. These bags look good, are lightweight, and have numerous pockets, making them ideal travel partners. Of course, they may not have as long a lifespan as more rugged backpacks. One of the main reasons that people gravitate towards backpacks is because of the suspension system – the way that you can carry the bag. This is precisely why it is so important for you to always examine this system before going ahead and purchasing a backpack. With smaller backpacks, all you really have to think about is the shoulder straps. They should be a bit wide and have enough of padding. This will allow you to carry your bag for longer without it digging into your skin. If you will be carrying a greater weight, though, you may want a backpack that has a padded hip belt, since this is where you will be carrying most of the weight. To make it easier to stabilize your center of gravity, look for a sternum belt that will hold the backpack in place while you are walking. If you are either going on a trek or will be backpacking, you will require a backpack that allows for proper air circulation around your back. This will prevent your back from heating up and sweat from accumulating. For this feature, look for backpacks that have padded, mesh-covered mounds on the back. This leaves space for cool air to move around. One thing you will come across when you go looking for backpacks are ones that are meant specifically for women. Since many of these have pretty patterns or are brightly colored, it is easy to wonder if they are actually different from the ones designed for men. Interestingly enough, backpacks are one of the few commodities where it can pay off to buy women-specific backpacks. This is because they have been designed to fit shorter torsos, narrower shoulders, and wider hips typically associated with women. This all means that you will find it a great deal more comfortable to carry these backpacks if you are a woman. Nonetheless, if you tend to be as tall as the average man or have a similar build, you will be just fine with most typical backpacks. So, what else should you look out for with travel backpacks? Well, since you will be moving from place to place, presumably with some rather important documents or items, you should be concerned about security. This means looking out for backpacks with lockable zippers. This will help to prevent anyone from going through your things. Of course, you should still keep an eye out for your bag since all anyone has to do is simply walk off with it. Another thing that you may want to look out for is compression straps. These actually have a few advantages. Now, obviously, their main function is to prevent the items in your bag from moving around too much. This can be handy if your bag is not at full capacity and you are carrying breakable items with you. The other benefit, however, is that it can help your bag to look smaller. This is useful if you are trying to take your bag onboard an aircraft with you. The more compact the bag appears, the more likely it is for it to be passed through. Now you know what it takes to find a travel backpack that you can take practically anywhere with you. With these tips, you can choose your ultimate traveling companion. Classic travel backpacks and models that haven't yet got enough reviews to be ranked. List ID 69. Images from Amazon Product Advertising API and shop datafeeds.